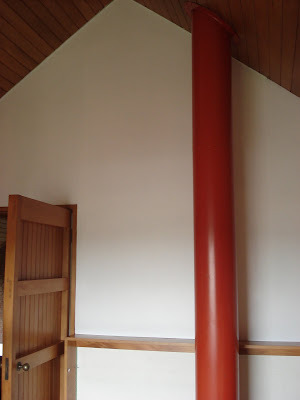 Our Christchurch Modern: The painting continues..
My brother came down from Auckland at the start of the week and he and my mum spent the bulk of the week painting the interior walls. It was a mammoth task and we could never have done it on our own. The main bedroom looked so much better without the purple (above). And painting the hallway/stairwell made the whole place so much lighter..
Boo got a bit bored midway through the week, as were so preoccupied, so we ended up shipping her off to Karly... for a bit of a retreat. 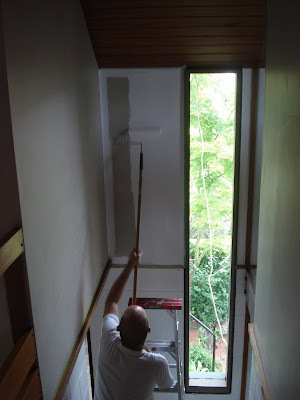 Matt had the unlucky job of standing on builders planks in the mezzanine between our bedroom and the office and painting that wall..while Arch finished the stairwell - you can see how filthy the 'cream' walls were in this photo (and that's AFTER scrubbing with sugar soap)..
Then we were almost done!